Macquarie Group is a leading provider of banking, financial, advisory, investment and fund management services with international divisions in Australia, Korea, London, Dubai, and Singapore. 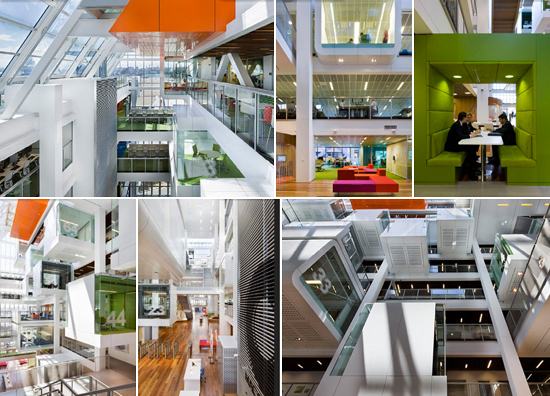 In 2006 the group set out to facilitate a new approach towards the design and functionality of modern office environments. Based in Sydney, the Macquarie Group acquired a building on One Shelley Street. The project took approximately three years to complete as California-based Clive Wilkinson Architects collaborated with Sydney's Woods Bagot architecture branch to design the 330,000 square foot interior. Since its opening in 2009, One Shelley Street has won a variety of awards and praises for its creative design and take on environmental sustainability. One Shelley Street serves as a healthy dose of inspiration to Wellbuilt's pursuit of environmentally sound design and build solutions.